I wanted to write about my son’s experience with a palatal expander, mostly because when I googled to learn about it, I found there’s not enough real information out there. Or should I say good information beyond the stories highlighting pain! agony! money! …you know the drill. Hopefully, if your child needs one, I can at least offer up some real info and peace of mind. What is a palate expander? It’s a dental device that widens the upper jaw. It’s usually done before braces, and most effective (and painless) when used on children… mostly because the palate has not fused yet, so the widening part is a little less traumatic. D in the hospital, poor baby! D has A LOT of issues with teeth crowding, an overbite, and a very small mouth. The perfect storm that leads to braces. Using the palate expander is the first step in making room for the rouge teeth that can’t squeeze into place. Ironically, just as we started the process (in November of last year), D had an accident on his bike. He broke two permanent teeth (Argh!! I KNOW! It couldn’t have been the baby teeth, right?!) which made the process even more important since one of his damaged teeth split up the middle, and buried in his gums because of the crowding. He had a few appointments leading up to the placement of the appliance, mostly for x-rays, impressions, spacers, and preparing his teeth for the device. His device was placed on December 12, 2012. He had the easy part… me, I had the job to turn the appliance each night with a key. Yes, it’s exactly as you imagine… each night my hubby held a flashlight, and I had the distinct honor to crank the device. For 30 days. Trust me, the only pain felt by anyone was my severe mommy angst wondering if I was torturing him. D had zero pain, except for an immediate sense of tightening which went away minutes later after each turn. First couple of days? The biggest challenge was eating and talking. It takes time to get used to a metal gear in your mouth, and D was none too happy at first, but after the initial couple of days things were starting to look up. By the third day we transitioned to no-soft foods, and by the end of the week, he was eating normally again. As for his speech, they say that it comes back in time, but to be honest he had and has continued to have a really hard time pronouncing some words (mostly those with a long “e”) and… well, it did get better but not perfect. I guess this varies by individual. The last 6 months have flown by! I already see improvement in his mouth, and since he is starting to lose baby teeth again, he now has the room for his second teeth to finally drop down. Yep, they’ll be crooked, but that’s for the braces to straighten out! As for the damaged teeth from the accident, we will need bonding for his chipped front tooth, and (maybe) root canal or replacement for the other one. That remains to be seen for now. We will take it one day at a time. Edit: I posted an update on D’s progress. Didn’t read it yet? Get it here. Thanks – easier to read than a forum. My 9 year old daughter is getting her expander tomorrow and I’m feeling so much better after reading your post and the comments, thank you so much. We’ve been told that we’ll be cranking until there’s a gap between her front teeth, then rest while the gap filled in and then start again until everything is in the right place with all up being . She has compacted teeth due to lack of space as her upper jaw is smaller than the bottom one and a cross-bite to deal with. All up hopefully it will be out in 9 months – fingers crossed. Thank you for the info. We just got back from the ortho and 13 yr old son got expander and braces at the same time. They said he will have to wear aprrox 6 months but only turning for 14 days or so. I was freaking out after she told me to watch when he eats because he may not be able to swallow! He did fantastic getting everything done-I am the big weanie in the family but he was a trooper. It was lunchtime when we were finished and he was starving so I made a trip to get a milkshake and attempted burger and fries. When the milkshake was difficult to swallow I knew the burger and fries would be a disaster. And yes it was! So I stopped and got him mashed potatoes at KFC before sending him back to school. The warned me against spaghetti-said don’t do it-it will go half down the throat and half in the expander which will make him gag. I was grateful for the warning. I was so worried he wont be able to eat without choking but know that I read it shouldn’t be too long before it feels more normal I feel better! So thank you! Does your son complain about eating certain foods,and what were some of the best non”baby food” (according to my son)items. He says breads, chicken, most pastas make him choke or become stuck. I get that, I really do, but I am about to smack the expander out of him. He is a meat and potato kid, with a serious love for pastas and breads. I think he probably can eat a lot of his favorites , but doesn’t want to put effort into slower eating, smaller bites. Yes, breads are tricky. If he’s a pasta eater, try ziti or larger shaped pasta. Regular spaghetti just gets caught and becomes pasty- sticks all over the appliance. Regular bread is best eaten in smaller bites with lots of liquids inbetween bites. It’s really more about drinking with each meal to ensure bite after bite doesn’t build up in and around the appliance. However, that being said, there’s always the dental picks to save the day and fish out unwanted food particles. We kept them everywhere just in case! How long did he have to have the expander on? Was it just the initial month of cranking or did that continue throughout the treatment? The expander was actually in his mouth for a total of 9 months. The cranking part was just the initial 6 weeks or so. Thank you for this information. We just went to the Orthodontist and my son needs this debice along with braces due to a sever cross bite. I am worried and nervous about the pain but also the speech difficulty piece as well. Kids at the age of 9 can be so cruel. Good luck to you and your son Deborah! Thank you for this. We just went last night and found out my son needs the expander. They showed it to us and talked about. I was so nervous. Our adventure will start in 2 weeks. I hope everything is going well, keep us posted! I found your blog while looking for information, as my 8 year old is likely starting this process. We were told yesterday at her dentist appointment that her arch is too narrow for adult teeth to come in without crowding. We’re working on scheduling an appointment with an orthodontist, but your blog helped so much! Thank you for the personal information on the process instead of the wiki-version I find everywhere else! Before insurance, how much was it to get the expander removed? Thank you so much for posting your real experience. My son just got his day before yesterday and he’s really having a time eating. I’m glad to know that it will subside. You are right, there is no ‘real life’ info. on palate extenders out there! Thanks for the blog and for the great comments. My son gets his expander next week AND a tongue crib — at the same time. I’m so worried. I had an expander back in the 1990s and it wasn’t the best time of my life, that’s for sure. I know he’s going to have a hard road getting used to all that metal in his mouth! At least he has a couple of weeks to adjust before school starts. Did you have any difficulty using the crank? My daughter has just had hers ‘installed’ and to be honest I am having a complete meltdown. I cannot even get the screwy thing into the hole. I am certain I am hurting her or even worse the screwy thing will get stuck in her mouth. Is it support to be really difficult and really tight to turn? Advice please. I am so scared Friday I have to go get spacers. What do they feel like does it hurt? Then after that a palett expander. Do they hurt? I am SOO scared please help! I know this is a little late but I just had one out in and it aches all the time and it feels like my tongue is having a knive being cut through it. I seriously didn’t know it was coming until yesterday. Every time I lift my tongue it hurts because my jaw is so narrow that it has to sit in line with the top teeth. I want mum and dad to turn the screw faster so it rises faster but they said no because they r worried it may damage my palette. It doesn’t hurt when they turn it and I can feel some pain a while afterwards but I’ve dealt with worse pain for years. Pls help me what should I do and I want to enjoy the rest of my hold and not have this piece of junk in my mouth for any longer. I think most people with expanders deal with sore tongues. My son had a terrible time. It was truly heartbreaking. We finally found Tongue Guard at RPEguard.com. After the first night of wearing it, his pain was gone! I would highly recommend getting one before the expander is placed so tongue sores are never an issue. But it does relieve existing pain and speeds healing. Also which way do you turn the key? My daughter goes for expanders tomm:) thank you for all your input:) but she’s s pickey eater. Any ideas. This helped settle my nerves a lot. I get my expander in exactly 54 days (I know I’m kinda weird…counting down), I have to wait so long because of summer camps and the week for spacers, and then the two weeks where the impressions with the molar bands are sent to the lab to create the appliance. I’ve kind of been freaking out because I’m going into eigth grade and I don’t want a lisp…plus my orthodontist said I would get a gap in between my teeth, during the 3 week process. I wouldn’t care except I have school pictures during the 3rd week. Ugh. But your post really did still help me a lot. This is exactly my situation! (8th Grade, gap between your teeth) except I got mine today. Its not so bad. But try finding an alternative word for “you”. When you say “you”, it comes out a big blobbery mess. My 9 year old son got his expander in yesterday and it’s been a piece of cake! Besides the gross slurping sound he makes because apparently salvia gets caught up there & talking a little funny — he hasn’t had any issues! Thank you for your blog! It’s so nice to know what may or may not be ahead for us! My 12 year old daughter gets her expander next Monday and noted all the comments about foods they can eat and was wondering what suggestions any of you might have regarding how to handle her lunch at school? Ed, I would suggest that for the first 2-3 days, stick with foods that won’t have the remote ability to get stuck. My son took mashed potatoes in a thermos, pudding, jello, yogurt, soup without pasta.. like tomato or broth. Do not try pasta (save that for later and stick to ziti or shells.. Definitely not long spaghetti! And save the questionable foods for home. Be sure to invest in a water pic, and the little dental picks for when something does get stuck. And lots of liquid! Good luck, it will be old hat for her within a week. Oh my gosh! The slurping! LOL!! My son is doing it constantly. haha! My 9 year old daughter got an expander put on 2 days ago. she hasn’t eaten anything. she cries and I feel awful! Plus I have my husband saying I shouldn’t have done it…that doesn’t help either. she is a bit of a drama queen so I’m thinking some of this is exaggerated, but trying to find foods for her to eat has been impossible. she won’t try anything because it’s uncomfortable for her and her tongue has sores so everything hurts her now. I will go get a waterpik today and look for rinse and meds for mouth sores. thank you for the comments. I got some good information from them. Mine did not anything but milkshakes from cookout for 5 days. It was miserable. Then he was fine and didn’t complain for 7 months. He just got it off and you can totally tell how much better hismouth is. Avoid long noodles. My daughter 9 just got this yesterday, there has been no pain but she cries every time she tries to eat. We finally settled on tomato soup but she added cheese and we’ve spent the last 10 mins with a toothpick getting cheese out. I would love pointers on food, she is not picky but does have a little drama queen in there:) Also I get that she’ll get used to it but it seems food will continue to get stuck in it. Thanks for sharing, i’m a bit nervous too, my 9 yr old son will get his the day after tommorow. Wis us luck! 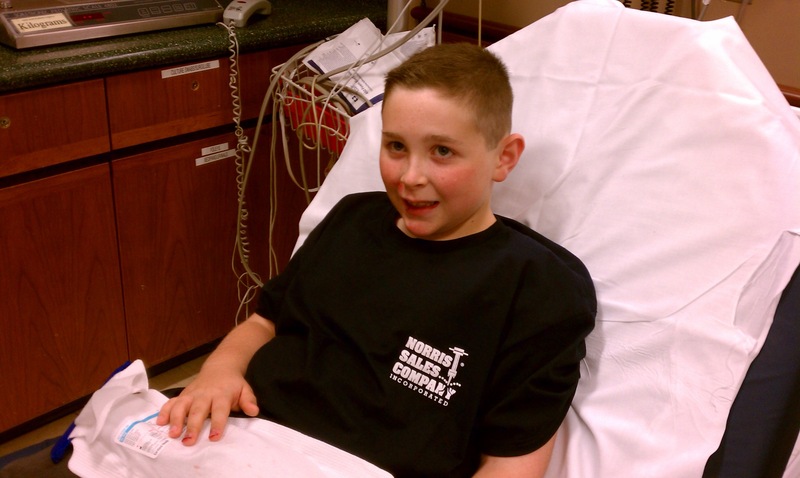 My then 9 yr old son had an expander with a thumb guard put in on Aug. 29, 2013. He was a big time thumb sucker up until June of 2013. After seeing the Orthodontist and she said the 2 dreaded words to him “jaw surgery” he went cold turkey and gave up his thumb sucking. Thanks Dr. lol Anyway, the first 2 days where extremely rough. Everything got caught on the thumb guard and then the roof of his mouth. He had a breakdown once and I managed to get him drinking banana milkshakes and that helped his mood a lot. Then is slowly progressed from there. The speech was something else too. He had to repeat some things many times, sometimes even using hand gestures. lol The thumb guard came out on Nov. 29, 2013. We only had to turn his device 2 times a week and after his visit yesterday, Jan.15,2014, we need no more turning for the next 3 months. Then I think it’s onto a retainer till the rest of his permanent teeth come in and braces can go on. So I guess it’s gonna be several more years all together and all mostly caused by thumb sucking. Oh well, at least it can be fixed. Thank you for your article. My 7 year old so just had his expander installed today. and, currently i feel horrible and want to rip it out. Stupid me should of read some of these articles before. I made mac n cheese and a big ole noodle got stuck. pushed it out with a pick, he gagged then threw up. UGH! if only I had stuck with simple stuff like ice cream, mashed potatoes, apple sauce. he cried and cried and wants it out, frustrated that he can’t talk, doesn’t know how to rest his tongue and so on. He is afraid to go to school tomorrow as he thinks no one will understand him. Breaks my heart. But, i know it will only get better….at least that’s what I am telling myself. It gets better! Stay away from pasta. It tends to stick like glue. Stay with soft goods as you mentioned, and I promise it will get better in a day or two. I have two kids 10 and 9… They are getting them at the same time. Thank you for this post, I plan on documenting the experience. My 13-year old daughter got an expander 2 days ago and hasn’t been able to eat anything solid. She is “grossed out” by the food getting stuck between the expander and the roof of her mouth. Also, she says everything tastes like metal. Any suggestions? Good news, the metal taste goes away. My son had the same reaction too, but the most helpful advice is to stick to the softer foods she likes, then add in the more challenging foods. And, invest in a waterpik, which will eliminate any food that gets caught in the device! It really becomes second nature after a week or two. Come back and let me know how it goes! The metal taste will go away. my 7 year old had to drink milkshakes the first 5 days. we also had to use a dental floss pic to push the food out when he did eat. cut the long noodles so they dont get wrapped up. Also, he does the thing with his mouth, like he is making a Ka Ka Ka sound, it pushes the food out. Or he gets water and uses a straw, and drinks fast, that helps push it out too. Use wax on the sides the first week if it causes ulcers. He thinks the first 7 days was the worst, but then it was not to bad. 3 weeks left and he gets it off! I just found out my 10 yr old daughter will need the expander, i’m so thankful to all that posted their experiences. I’ve been so stressed about causing my daughter pain. thank you for helping me feel better about it. Hey! I’m 11 and I just got braces AND an expander. It’s Day 2 and the expander is like having a horse bit! Totes lame! I’m pretty sure that your daughter will be ok. It hurts but not unbearably and the lisp is pretty fun. I enjoyed talking really fast and having all the words slur together. Tell her to remember that it’s in her best interest and try ice packs, cold washcloths, and pain med. Stay strong! This was really good! My 14 y old daughter just got an expander AND braces 3 days ago! She has to have the expander for 6 months, but as she is 14 I am unsure if it will be more painful? She has been complaining about not being able to talk and swallow food and I feel horrible for having her go through this. This article is really a lot of help,thanks! Day 3 for my 7 year old son with the expander. We’ve been instructed to turn it twice a week, not every day. I imagine that every day would be brutal, as they hardly have a chance to adjust before it’s time to crank them again. We haven’t experienced sores and I have no idea what this wax business is about. I came online to see how to help him with eating/swallowing, since it looks awkward for him, but after reading all these posts and articles, it looks like he’s pretty lucky. He’s not uncomfortable or in any pain, and he thinks he’s a superhero and named himself, “Metal Man”. Let’s hope the next six months fly by incident free so this annoyance can be done with. In hind sight, I feel bad for having it put in, only because I don’t think it was an absolute necessity. He has a cross bite, but it’s not a big deal. I actually think his little crooked smile is charming and adorable. Thank you for this! I was just informed my 6yr old son is needing one due to overcrowding and cross bite. I feel much better after reading your experience with it! The only thing I would add to this is to consider purchasing a Waterpik to clean out the stuff that gets between the expander and palate. My daughter loves hers, gets junk out of the braces well too. Thank you for this post. My son is 7 yrs old and he needs to get the expander, but I am going crazy trying to make that decision, I feel so horrible thinking that my child will be in pain. How much does a palate expander cost? My 6 year old will be getting one a few months after he turns 7. I’m sure the prices vary wildly depending on amount of visits and whether the fee is tied into another service. I paid about 800-900 dollars. My daughters was about 350 after the insurance paid their part. Thank you so much. My daughter had an expander and braces fitted two days ago. Its been hell and turning the key twice a day traumatic. I’m glad it will get easier. Thank you! My son is 7, and i just made an appointment today for the ortho to put in the expander. After reading your experience, I feel somewhat prepared for what to realistically expect. Thank you so much for sharing D’s experience! My son (8 yrs old) recently got his expander put in on July 22nd and I was struggling with whether or not I made the right decision to get this done at such a young age. He had a lot trouble eating/pain the first couple of days, but by the 3rd day he was figuring out how to eat. Now, he is a pro! LOL Again, thank you so much for sharing! My son just got his expanders today and he is going nuts with the food getting stuck on it! How D did at school at lunch or snack time! Because my son can’t get the food out just with a toothbrush, he has to use the water pick but it will not be available at school! Please give us some advice!! Luciana, I packed a small container with two sizes of throwaway dental picks in his backpack. They look like toothpicks with little christmas trees on the end. You can bend them and get up and behind the expander to get the food out. D never left home without one in his pocket. Also, it will take awhile for your son to get the hang of figuring out how to dislodge food particles on his own. If he just got it on, he’s probably still getting used to it. It will take a week or so until he figures out how to move his tongue around the expander and swallow. Especially if he’s trying to eat foods that are not soft. Hang in there, and let me know if you have any questions! I think I will be posting again to provide an update of D’s progress. my son got his yesterday. today we are dealing with mouth sores, so i got wax and some kanka pen that puts meds on it. plus mouth sore rinse. he tries to eat but it hurts to bite down (spaghetti o’s!) so he just had a milkshake. still doing motrin. Carrie, I found that worst offenders for getting stuck was (ironically) spaghett o’s and straight cut spaghetti. Ziti was the only pasta that did not get stuck! The mouth sores will go away. Keep using the wax. Eventually you won’t need it. It’s really lucky that more kids have palate extenders available to them nowadays. It was in the early 90’s when I should have gotten one myself, I needed it. Later in my teens I went through the braces, tooth extractions (all ten of them!) 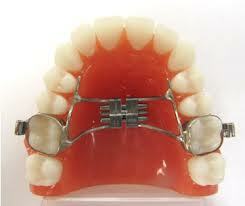 and the in-mouth pulley system which pulled or pushed my crowded teeth into place. I feel really disappointed that I missed out on such an important part of that process. Despite the pain and discomfort experienced for both children and their parents at present, remember to focus on the big picture! It might have hurt me a lot having braces but I can now appreciate my determination and patience all the more. Your kids will thank you in the future. So glad you shared your experience with the expander – wish I had known these details before I had to “crank” for my daughter some years ago. I’m going to post this on my Wired-In blog at http://www.MetalMouthMedia.net!